Want to know how much an arm lift costs? 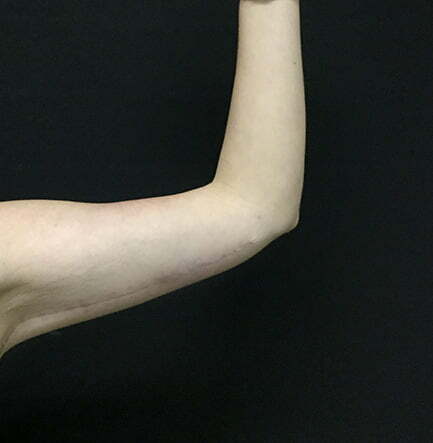 An arm lift, or brachioplasty, is a surgical procedure that reshapes the upper arms by reducing excess skin, and in some cases fat, resulting in smoother skin and better-proportioned contours of the upper arms. Arm lift surgery may be right for you if the underside of your upper arms are sagging or appear loose and full due to excess skin and fat. It can tighten and improve the contour of the upper arms. Sometimes it may be used in conjunction with liposuction to target both excess fat deposits in the arms and also address the excess skin elasticity with skin excision. 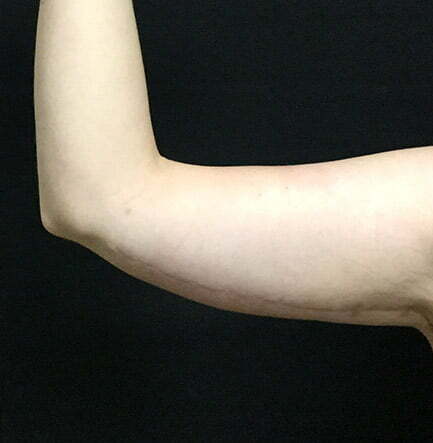 An arm lift cannot correct weakened muscles of the upper arm; in fact many individuals who seek surgery are relatively fit individuals who are bothered by a condition that cannot be corrected through exercise. before and after brachioplasty with Dr Sharp: this patient had a full body makeover including breast reduction, arm lift (brachioplasty), abdominoplasty and thigh lift surgery to remove excess skin after massive weightloss, while reducing back pain and skin irritations. 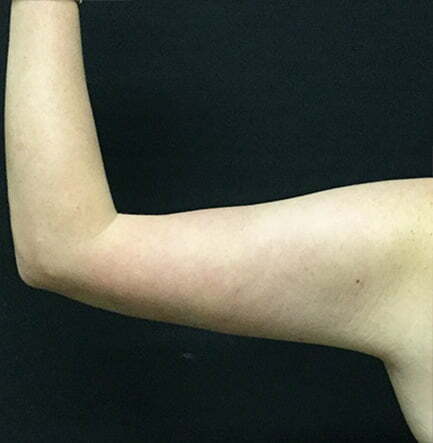 before and after brachioplasty with Dr Sharp: this patient had a breast reduction and arm lift to create a lifted, more balanced upper body shape, while reducing back pain and skin irritations. 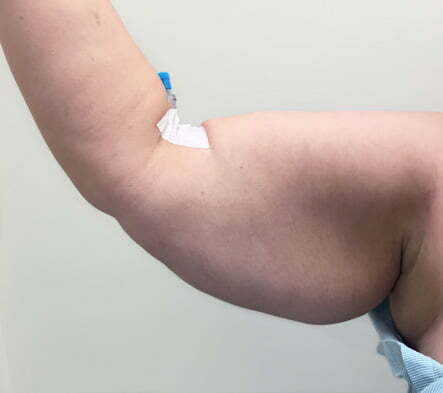 What is involved in brachioplasty surgery? As part of your pre-operative consultation process, Dr Sharp will discuss the location options for your arm lift procedure. In some cases, it can be performed as a day case, meaning you will return home on the same day - with 24/7 access to post-operative support. Or you may choose to have the procedure as an inpatient, with an overnight stay. Brachioplasty surgery is performed under a general anaesthetic with a specialist anaesthetist meaning you will be completely asleep and feel nothing during surgery. The procedure begins with an incision placed in the inside of the upper arm. The incision may extend from the underarm to the elbow, or be more limited in length. Incision length and pattern depend on the amount and location of excess skin to be removed. 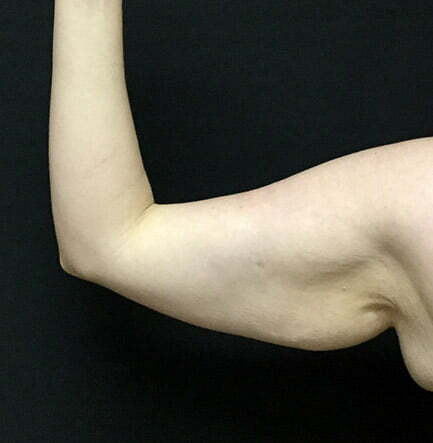 If fat will be reduced during your arm lift, it will be excised or treated with liposuction techniques. The underlying supportive tissues are tightened and reshaped with internal sutures. The overlying skin is then smoothed over the new contour of your arm, with excess skin reduced. Your incisions will be closed with absorbable sutures or stitches that will be removed within one to two weeks following your arm lift. You will also be instructed to avoid lifting or bearing any weight on your arms for several days to weeks. Your surgeon may also advise you to limit your range of motion until internal healing is complete. You will be ready to return to work and light, normal activities within a few days, as long as you do not engage in any lifting or vigorous exercise. Follow all instructions carefully — this is essential to the success of your outcome. Your incisions will heal within 7 to 14 days, after which time sutures will be removed if necessary. Additional healing will continue for many weeks as swelling resolves and incision lines continue to improve. Numbness and a firm feeling over the skin’s surface will resolve over time. You must practice diligent sun protection until the healing process is fully completed or skin in the treated area may develop irregular pigmentation and scars may become raised, red or dark. It may take a year or more following a given procedure for incision lines to refine and fade to some degree. 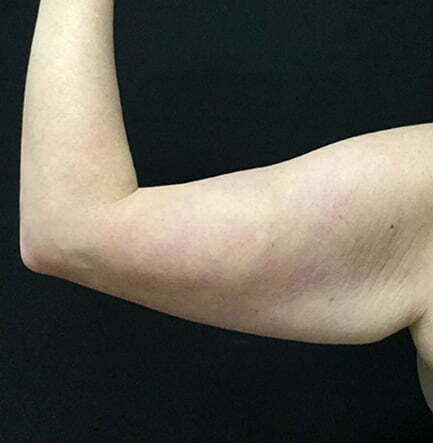 Healthy nutrition and regular physical activity, including core strength exercises and practicing good posture, are integral to obtaining and maintaining optimal long-term brachioplasty results. Dr David and his team can also medically support your results after arm reduction surgery through the nonsurgical treatments he offers, including SculpSure. Utilising safe, state of the art technology, SculpSure comfortably removes 24% of your remaining fat and tightening loose skin in one 25-minute treatment. Fees start from $300, and there is no downtime or pain involved with this treatment, making it a perfect solution to support your long-term arm lift results. Contact our experienced clinicians on 3202 4744 to find out what’s possible for you. Although good results are expected from your procedure, there is no guarantee. In some situations, it may not be possible to achieve optimal results with a single surgical procedure and another surgery may be necessary. Even if you have a normal body weight, good diet and active lifestyle, it can be difficult to achieve smooth, toned upper arms. Genetics plays a role in where our bodies store fat, and the upper arms can be a common place for lose skin and fat to impact the aesthetic appearance, particularly in strapless or armless clothing. Significant weight fluctuations after brachioplasty surgery can impact upon the results, so maintaining healthy nutrition habits and exercising is an important part of ensuring you get the best out of your results for as long as possible. It’s normal to feel both nervous, and an excited sense of anticipation when planning your tummy tuck. Dr David takes the time to ensure you have as many consultations as you require, to ensure your treatment is customised to suit your body and expectations – and address any concerns you may have. Some factors, such as weight, poor nutrition, lifestyle or health problems can increase the chance of a complication occurring. Dr Sharp will take time to learn about your potential risk factors during your pre-operative consultations, and will determine if they are relevant to your surgery. Does arm reduction surgery remove stretch marks? An arm lift does not correct specifically stretch marks, however, some of these might be removed or reduced if they are located on the excess skin that is removed. Dr Sharp’s clinic offers a range of safe skin therapies that have been scientifically proven to reduce stretch marks – without surgery, needles or downtime. If you are specifically concerned about stretch marks, call 3202 4744. Brachioplasties are performed under a full general anaesthetic. A specifically selected range of medications are administered during the surgery to ensure your post-operative comfort. Dr Sharp works with an experienced and friendly team of anesthetists. How much time should I take off work after arm lift surgery? You can return to light activities with a few days, but avoid strenuous activity for up to six weeks. Depending on your work, you may need to time your surgery around your work leave; in this case, it is important to have as much time as possible to plan the surgery and ensure you can book in for the procedure during your required leave period. How much do arm reductions cost? Brachioplasty for cosmetic reasons is not covered by Medicare or health insurers. However, in some cases, your surgery might be classified as reconstructive, and therefore have a Medicare item number. If so, you might be eligible to claim a rebate from Medicare, as well as your private health fund. In these cases, after a consultation with Dr Sharp, an application for pre-approval can be lodged with your health fund – to assist with forward planning your out of pocket expenses. It is important to understand that, in the case of complications or revision surgery, the cost of your brachioplasty might extend to future surgical procedures and hospitalisations. We encourage patients to think about how they would fund further treatment beyond the immediate costs expected. Brachioplasty: A surgical procedure, also known as arm lift or reduction, to correct sagging and excess skin of upper arms. Ask us your questions about brachioplasty surgery!